The Shiny Vampire Club: How Awesome Is This Cake? or maybe she is already a twilight fanatic? Either way, It looks great! I hope her daughter loved it. 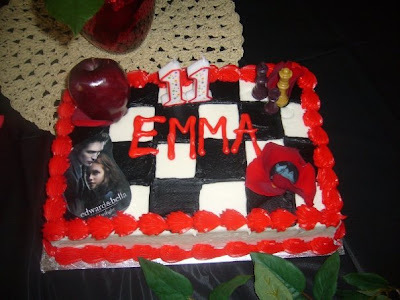 I wondered how many tweens would be having "twilight" themed birthdays now, haha. Not sure how the black icing would taste though, or look on your lips & teeth?! haha! Ginger Black frosting isn't bad! it does make your teeth funny colors though! do we have a pic of that babyshower cake anywhere? that looks good. too bad my parents think I'm "too old" for a big birthday party with a theme. Besides, I don't think it would still be good by the time it got to Canada. The icing would be all smushed up. yes zoe, poor us! but that cake looks really, really good!! yummy! I'm being a pessimist. I know. Sorry.